With skipper Mahendra Singh Dhoni in red-hot form, Chennai Super Kings will start favourites against the slightly off-colour Mumbai Indians when the IPL’s two most successful teams have their first showdown of the season on Wednesday. IPL 2019: Tiki-taka ahead of the El Classico! The upcoming Mumbai Indians clash with defending champions Chennai Super Kings is referred to as the El Classico of cricket on social media. Rightly so, as the two teams have a rich history of rivalry among themselves. CSK and MI are two of the most successful teams in the history of the league and hence the clash between the two is a much-awaited clash. Dwayne Bravo has come good with the ball in the death overs and has proved his worth even at the age of 35. 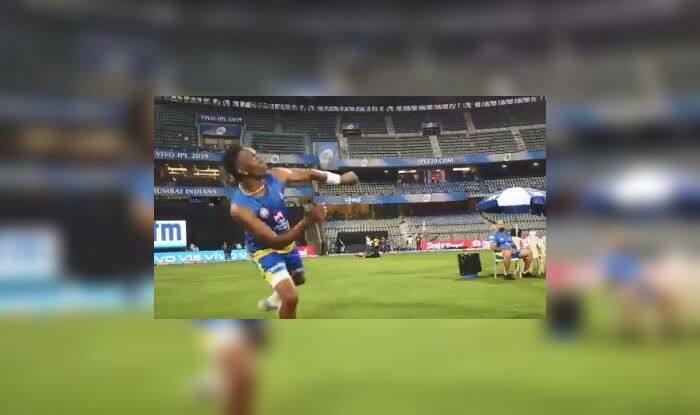 The West Indian was spotted sharpening his soccer skills ahead of the big clash at Wankhede. Here is the video where you can see Bravo playing soccer with physiotherapist Tommy Simsek. Meanwhile, the Trinidadian is on the cusp of a milestone for Chennai, he needs just one more wicket to become the first bowler in their history of IPL to complete 100 wickets. With 99 wickets, Bravo tops this particular chart ahead of Ravichandran Ashwin, who scalped 90 wickets for the three-time champions. Bravo also enjoys an excellent record with the ball against Mumbai. He holds the record for most wickets taken against Mumbai Indians in the cash-rich league. With 27 wickets against his name, Bravo leads the pack ahead of Piyush Chawla (23) and Mohit Sharma (22).